Magnolia Conference 2013 has left town. Time to sum up the results. 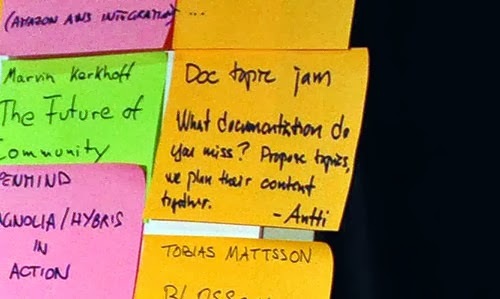 I organized a Doc Jam session to collect feedback on documentation. Name a documentation topic that is missing. Help us write a table of contents for it. Here are the top three topics proposed by the attendees. How can an administrator tell a system is healthy? Events to log routinely vs. events to log when in trouble. Issue scenarios like what to do when the search stops returning results. Idea! Create a Health app that provides vital stats. Replicating a complete site to a dev or test environment. Configuration to change after cloning. Changing subscribers to avoid publishing content to production. Nodes that are OK to activate from author to public. Nodes that are not OK to activate such as the anonymous role. Thank you to everyone who proposed topics. We will write about them and post updates. If you didn't get a chance to attend the conference, post your request on the Magnolia forum. See you next year!